I created a game of Tic Tac Toe using an Arduino, 18 flip-flops, 2 AND gates, 9 multi-colour LEDs, 3 breadboards, and a ton of wire. 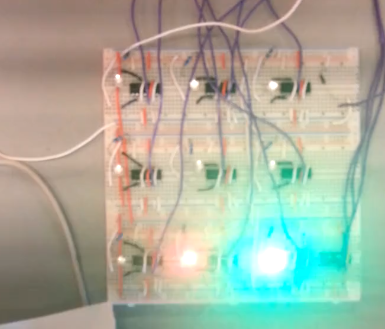 Each LED was powered by two flip-flops, one for each player. The values of the flip-flops were set by the Arduino, which was controlled by a program written in C. The single button allowed players to cycle through their options with a short press, and to select one with a long press.